Being hailed as the saviour of modern day pop-punk The Story So Far has an impressive reputation that proceeds them. As well as playing a handful of headline shows, the five-piece are over in the UK to play Vans Warped UK Tour after its long awaited return. We sat down with bassist Kelen Capener before the show in Leeds on the "Road To Warped Tour" to chat about the forthcoming album, tour life and British food! You’ve fitted in some headline dates before the Vans tour – how were they? It was good; it warmed us up. We hadn’t played a show in a long time because we were recording an album, and this summer was the first time that all five of us were able to be back from school and play shows together. It’s good to build up that chemistry and get our rhythm and play these shows. It’s mid-point in the Road To Warped Tour and then you’ve got the big event on Saturday. How’s the tour been going so far? These are some of the biggest shows we’ve ever played, capacity wise; bigger stages and it’s a different experience. I’ve been loving it. It’s just a bigger deal than what we’re used to. Is it nice being out on the road in the build up to the main event? We did the same thing with Slam Dunk Festival so it’s great to see the countryside and stay busy; it’s the best way to do it. Just the fact that we’re in another country, playing for kids, it’s awesome. Do you like being over the UK? Yeah, I really do. Can’t say I really like the food very much though, or maybe we’ve been eating at the wrong places. I like Nandos; at first I wasn’t too impressed but I warmed up to it. The way people approach music over here is different. You guys have rock clubs whereas in the US we don’t have that. Here, anyone can pretty much go to any show and it doesn’t classify you in a certain genre. You’re touring with New Found Glory, you’re named after one of their songs- is it great now actually being on the road with them? Y’know, when we were kids we didn’t think we would be touring with them one day; I think that would have been really wishful thinking. We named our band after them without really thinking about it too much. I mean we love that band and it’s in the same realm of music that we’re playing. But now we’ve been able to meet them and play shows with them. At that point it’s kind of like “we were young and we named our band after you” [laughing], but they were really nice. Steve was giving me a hard time, but no, it’s cool. He’s producing our album now. I was going to ask you how it was working with him? Yeah, we all love Steve; he doesn’t hurt the integrity of our writing process at all. He coaxes us and helps us structure things, but we still have the music and stuff. NFG have been a band for over fifteen years now- where do you want to be fifteen years down the line? Well I’m a big future thinker but like three years ago I was just starting school. Next thing you know I’m in another school and the next thing you know I’m taking school off to do this. So I don’t know if I can keep track [laughing]. Things keep changing, I can’t keep up. In fifteen years, I hope we’re not behind a dumpster, but we’ll see. You’re working with the same team and have stuck with the same label for your new album- do you feel you have a good thing with them? Yeah, essentially Jake took a risk on us and funded our first E.P. I was like sixteen then; I’m twenty-one now and we recorded at a friend’s studio. A bigger label may have more money but we’re not in a bad situation. If The Story So Far imploded it wouldn’t be devastating. It just shows that you don’t really need all that money behind you; the music speaks for itself. Do you feel under pressure after the success of your previous releases? We kind of put ourselves under pressure without actually putting ourselves under pressure. At the end of the day we just have to do what we think is best and really satisfy ourselves, and then if people don’t like it then they don’t like it. Honestly, you’re going to have those kids that are always going to hold your first album in the highest regard, it’s not always something you can control. We just have to put out something that’s logical, that’s a follow up. 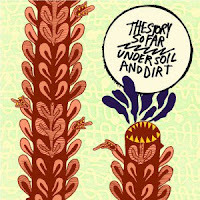 The album "Under Soil And Dirt"
What and when can we expect it? You have been hailed as saviours of the modern pop-punk scene. How do you respond to that? Erm…I don’t know. I kind of think it’s funny. I always think of pop-punk as something that happened to me; I listened to it as a kid and now it’s had a resurgence. But I wouldn’t really know about this new collective if I wasn’t playing in The Story So Far. Typically what I listen to isn’t pop-punk. Being hailed as that is cool, but you’re talking about a very selective listener. What we want is to move beyond that. Obviously we love the honour of people holding us in that regard, but we want to extend that invitation of listening to our music to everyone outside of pop-punk. With such a strong line-up this evening at The Road To Warped event, the crowd is in early ready to catch the Walnut Creek five piece, The Story So Far, who are first up tonight. As the quintet take to the stage they are stirring from the off, bounding confidently up and down and making their way through tracks taken from their acclaimed debut full length offering, “Under Soil And Dirt”. They may be the youngest band on the line-up, but don’t let that fool you; they are passionate and dynamic and their youth only serves to work in their favour. They are fresh and have an insane stage presence as they take the audience through the aggressive and soaring “Roam". They are gutsy and in your face, and tracks such as “High Regard”, with its huge hook, demonstrate Parker Cannon’s powerful vocals. The percussive Mt. Diablo is at one raw and intense, yet melodic and anthemic. 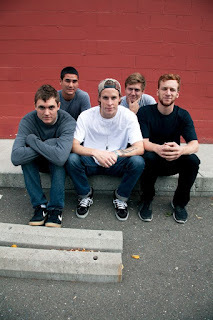 Routed in punk rhythms and ethos The Story So Far is an exciting live band. The Story So Far is effortless; whether they were deliberately setting out to make an impression or not, they definitely did, regardless. With a new album out early next year we can’t wait to see more from them. 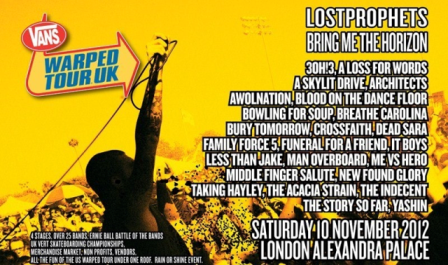 Be sure to check them out at the main event on Saturday at Alexandra Palace; you won’t regret it.